How do the Varicose Veins become Swollen & Painful? Varicose veins are the enlarged, twisted, engorged veins, typically seen on the legs. Veins are floppy, tubular structures that contain one-way valves, that with the squeezing of the muscles in the body, push blood from the body back to the heart and lungs. If the veins become swollen, or the valves no longer function properly, the blood moves with gravity causing continued swelling of the veins and prevention of the valves from closing, which causes the blood to flow backwards. There are many causes that increase the risk of developing varicose veins, such as family history, age, gender, excess body weight, prior trauma to the veins, and static positions. Why are Varicose Veins Causing Pain? Since these veins are enlarged and swollen and seen through the skin, it is no wonder that they usually cause some level of pain. Some individuals may not experience pain from their varicose veins, but are more concerned about the cosmetic appearance of the veins. The majority of those with varicose veins experience some level of pain, most commonly described as muscle cramping, throbbing, heaviness in the legs, or swelling. Call 305-363-1050 or click here to book a varicose vein pain consultation. These symptoms are usually worsened by sitting or standing for long periods of time. This allows for the blood to pool in the veins even more, as the muscles are not contracting, such was with walking. Additionally, the legs are in a dependent position, which means that gravity also plays a role in making it more difficult for the blood to be pushed back to the heart. Temperature is another factor that can increase the pain from varicose veins. Heat increases blood flow to an area by causing the blood vessels to dilate making the valves less likely to function properly to prevent the backflow of blood. How to Get Varicose Veins Pain Relief? As varicose veins can cause pain, there are ways to prevent pain from varicose veins. Call 305-363-1050 or click here to book a consultation at the Miami Vein Center. In order to prevent pain from varicose veins, consider use of compression stockings. There are special over the counter compression stockings and also prescription compression stockings that can be put on first thing in the morning, before any swelling has occurred after being asleep during the night. It is important to wear comfortable supportive shoes and avoid high heels, particularly with demands of standing through most of the day. If methods of preventing the pain from varicose veins are unsuccessful, there are several ways to try and treat the pain at home. First and foremost is elevation of the legs. This should at least occur at night, but can also be performed throughout the day. Elevation assist the veins in pushing blood out of the legs and to the heart by allowing the veins to work with gravity. Keep in mind that the legs need to be elevated above the level of the heart. Lay in bed or on the couch with 3 or 4 pillows under the ankles to elevate the legs adequately. Exercising and stretching is an excellent way to reduce pain. Throughout the day, stand on your toes to help stretch the calf muscles and change position frequently. Just as hot temperatures can worsen symptoms, take a cool bath or shower at the end of the day to help shrink the veins in the legs. As the heat will dilate the vessels, making them larger, the cold can shrink the vessels improving pain. If pain persists despite use of preventative measures or conservative therapy that can be done at home to ease pain, it may be time to see your physician for other alternate specialized treatments to help treat the varicose veins. 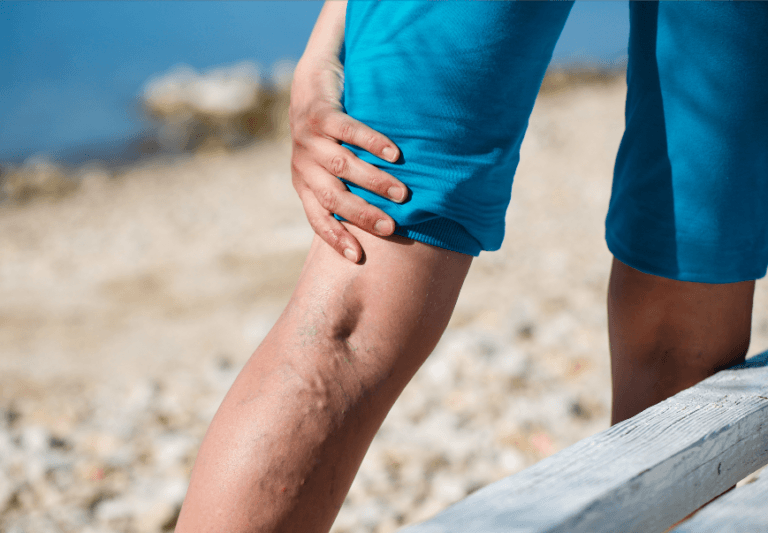 Can Vein Disease Cause Painful Legs?